Most parents have resorted to the tricks of the trade when it comes to increasing their kids’ intake of healthy foods by hiding veggies in forms that appeal to children. Like most parents over the years I’ve become adept at disguising vegetables in cakes and sweets – chocolate beetroot cake or carrot muffins anyone? This level of deception is justifiable when it comes to increasing our kids’ health. But it’s downright dangerous when used to entice kids and teenagers to unhealthy and risky products. This is why FARE is raising a storm in Victoria and the ACT, where Slim Chillers are selling copycat Zooper Dooper icy poles, each spiked with eight per cent vodka. 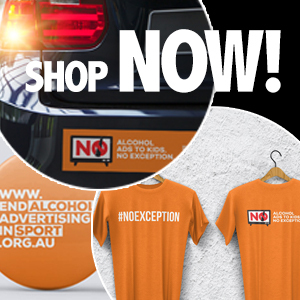 We believe it is unconscionable corporate behaviour to use product imitation to target young people with alcohol. The original Zooper Doopers are a childhood summer staple, beloved by generations of hot sweaty kids, featuring bright colours, with flavours based on fruit and confectionary such as ‘lemonade’, ‘lime’ and ‘orange sherbet’. The copycat product, Slim Chillers Vodka Martinis, has very similar packaging, colours and styling, with flavours such as ‘watermelon lemonade’, ‘appletini’ and ‘lemon drop’. On the Slim Chillers website, the icy poles are overtly promoted as being “like Zooper Doopers”. It seems likely, given the nature of the marketing material, that the similarities between the two products was a deliberate marketing strategy. These alcoholic icy poles can be purchased through the website by anyone with access to credit or an online payment account, including young people. It is completely irresponsible to market alcohol products designed to appeal to teens and children, and we have called on the regulators to do their job. Six weeks ago, FARE made formal complaints to the liquor regulators in Victoria and the ACT where Slim Chillers’ Vodka Martini Skinny Freezers are being sold through the warehouse chain Costco. The ACT Commissioner for Fair Trading has acknowledged that the product is being investigated and that the Minister has the power to declare the icy poles a prohibited liquor product. However, no visible action has been taken in Victoria. It’s hard to see that the response would be so slow for other dangerous products on the shelves. And make no mistake, despite the cheerful, colourful packaging, this is a dangerous product. Alcohol is a psychoactive drug and a group one carcinogen. It’s a causal factor in more than 200 disease and injury conditions and one of the leading contributors to death and disability. Among teenagers, alcohol is the major contributor to the three leading causes of death: unintentional injury, homicide and suicide. And there is extensive research showing that exposure to alcohol marketing leads kids to drink more frequently, at dangerous levels, and from an earlier age. Alcohol is no ordinary consumable due to its extraordinary toll – inflicting harm on society at a cost of $36 billion per annum. So alcohol-laced icy poles are not a harmless treat. They pose a serious risk to children and teens, encouraging consumption and making alcohol appealing. The copycat styling, packaging and marketing, which could be easily confused with Zooper Doopers, is a crass corporate decision that places no value on the health of our young people. FARE has presented a clear argument to have the product banned in the community interest. The regulator in Victoria has a responsibility in the public interest to prohibit the promotion of this product and consider sanctions against Slim Chillers. Unless there is a swift regulatory response, this dangerous product with its striking resemblance to children’s icy poles could quickly turn into the alco-pops fiasco all over again. The time for action is now.